For a good rosé wine, you have to look to Provence, right? Tavel and Bandol are two places cited in the Stepping Stone press literature where “they make rosé like they mean it.” Pink in California, they imply, is better left for breast cancer awareness than wine. Pink in California means White Zin, and that means the wine aficionados need no help getting those noses turned up in the air. At a suggested retail price of $20, the price isn’t high for a good rosé. And it is a good rosé. A 100% Syrah wine, it’s a single vineyard wine, too. The grapes come from Crane Ranch Vineyard in the Oak Knoll District of Napa Valley. The wine spends five months in French oak, picking up added complexity along the way. The alcohol sits at a lofty - for a rosé - 14.1% abv. 419 cases were produced. That’s not a lot, and the summer is long. Just a word to the wise. This true rosé wine looks pretty and pink in the glass, with not too deep a shade. Corallina’s nose is as fragrant as a garden. There are herbal accents, but the focus is on the fruit salad aromas that come forth. Strawberry and melon are right in front - I get honeydew and cantaloupe plus the factory-standard watermelon. There’s a lot more at work here, though. The Syrah makes itself known despite the pinkish hue, with whiffs of spice and faint blackberry. I swear there’s some cocoa in there, too, plus a bit of something earthy coming through. The palate is a fresh fruit basket with ripe cherries piled upon raspberries, apples and tangerines. Wait, this is still Syrah, right? The cost of that vacation in Provence just got knocked down to twenty bucks a day. My recent visit to Texas afforded me an unexpected meeting with a wine from Missouri. Stone Hill Winery's Hermannsberg Brand is labeled as a Missouri Dry Red Wine. On my brother and sister-in-law's porch with uncharacteristically great weather in southeast Texas that day - dry and sunny with a cool breeze blowing - I took a bit of relaxation. Their insanely quiet neighborhood provided a welcome respite from life in Los Angeles. This blend of Norton, Vincent and Chambourcin grapes hits 13% abv and shows a lovely medium-ruby color. On the nose, black cherry and roses move aside for a savory note. A little chocolate mocha comes through after it opened up a bit. The palate is fruity, with dusty cherries and a cranberry edge. It hit me rather like a Gamay, but with a little more muscle. Good tannins make for easy food pairing: bring on the brisket. Hitching Post wines are created in California's Central Coast by owner/chef Frank Ostini and former fisherman Gray Hartley. Gen Red is a Cabernet Franc blend made from grapes grown in several Santa Barbara County vineyards. The Cabernet Franc, some Merlot, and Syrah are from Alisos Vineyard, there's Merlot from McGinley and Buttonwood Vineyards and Cabernet Franc and Valdiguie from the French Camp Vineyard in San Luis Obispo County. As the website decribes, "The Cabernet Franc adds the intense aromatics, the Merlot adds body and roundness, and the Syrah and Valdiguie add color, richness, and fruitiness." The wine is medium-ruby in color with an extremely fresh nose showing brilliant cherry fruit and spices like cinnamon and nutmeg. The palate is full to bursting with bright cherry flavors, some cedar notes and a great acidity, which lends this wine its freshness. I'd love to get this for the holidays and right now I am going to write myself a note reminding me to do so. Gen Red was on the wine list at the Westside Tavern, which is the best excuse to see a movie at the mall on Pico. The restaurant is just down the escalator from the theaters, so it's great for grabbing a bite or a sip before or after a film. The wine cost $10 by the glass and $32 by the bottle, and both are pretty good prices in the realm of Los Angeles restaurants. Westside Tavern's wine program is one of the better efforts in L.A., and the food is out of this world. The wines of Spain's Rioja region are varied and always a delight. From crisp, young whites to fresh rosados to bright and cheery young reds and those with some age and oak influence, the wines of Rioja never fail to impress while showing off their terroir. The Rioja region lies between mountain ranges in the north-central part of Spain and is separated into three main sub-regions, Rioja Alta, Rioja Baja and Rioja Alavesa. Tempranillo is the main red grape, although you will often see Graciano, Garnacha (Grenache) and Mazuelo. For white wines, Viura is popular, with Malvasia playing a supporting role. Tempranillo wines are defined four different ways. Cosecha are young wines, one or two years old. Crianza wines are in at least their third year, with a minimum of one year in oak. Reserva wines are aged a minimum of three years, two for whites, with at least one in oak. Gran Reserva refers to selected wines from great vintages. They have spent at least two years in oak and three in the bottle. Whites are aged at least four years. It may sound a little complicated, but the system defines the wines of Rioja well. Not only do Rioja wines have a generally high level of quality, but they deliver it at very affordable prices. Most of the wines I will mention here are in the $10 to $20 range. A few went as high as $30, and some are under $10. Here are some of the standouts I tasted at a Rioja tasting sponsored by Vibrant Rioja at Fleming's Steakhouse in Beverly Hills on May 7th, 2013. It's not a Rioja tasting without a stop at the Lopez de Heredia table. WineWise had these, and the whites are simply outstanding. The Viña Gravonia Crianza Blanco 2003 is 100% Viura and has four years in the barrel and four in the bottle. The Viña Tondonia Blanco Reserva 1998 has six years in the barrel and is 90% Viura. These well-aged whites are really unbelievable. Ole Imports, distributed by Angeles Wine, had two fresh wines by Cortijo. The 2012 Rosado is all Tempranillo with brilliant acidity while the 2011 Tinto has 20% Garnacha thrown in, with only three months in oak. Field blend fans should take note of the El Brozal 2010 - roughly 80% Tempranillo, 10% Graciano and 10% Garnacha, grown together in the 1938 vineyard and co-fermented. There is an intriguing, savory nose and fabulous acidity. The VSL Graciano 2010 - the only 100% Graciano I saw at the event - is savory. It is fermented in concrete and spends only three months in oak. I found Undiscovered Wines in the far corner of the room. Rodriguez Sanzo's Lacrimus 5 is all unoaked Tempranillo, fresh and juicy, while their Lacrimus Rex blends Garnacha and Graciano for a dark, vibrant red that was one of my favorites. The Zinio Garnacha is lovely - a bit more savory than I expected - and the fruity, funky nose of the Heredad Garblo Crianza mixes four red grapes - Tempranillo, Garnacha, Mazuelo and Graciano. Importer CIV USA had some excellent wines from Conde de Valdemar. Their Sierra Cantabria Blanco 2011 is 100% Viura, aged three to five months in French oak. It has a distinctive floral aspect on both the nose and palate. Their 2011 Rosado is a pink-tinted blend of Tempranillo and Garnacha, from vines pushing 70 years old. Great acidity is the highlight, with an herbal strand and a nice touch of oak. Their Crianza 2008 has an exceptional nice oak effect and a savory side that dominates. Dinastia Vivanco Blanco 2012 is a mix of Viura, Malvasia and White Tempranillo. The pourer told me, with a laugh, that the last grape is nothing like White Zinfandel. It is a natural mutation of the red Tempranillo grape and was not discovered until 1988. This wine displays a huge streak of citrus. Their Rosado 2012 is Tempranillo and Garnacha, showing a garden of strawberry. The Vivianco Crianza 2008 has lively, young fruit while their Vivianco Reserva 2005 is a mature blend of Tempranillo and Garnacha. From Fine Estates of Spain, Jorge Ordonez Portfolio, comes a nearly perfect Sierra Cantabria Rosado 2012, with strawberry, cherry and fantastic acidity in the Tampranillo/Garnacha/Viura blend. They also poured the Finca Allende Blanco 2009, a 90% Viura/10% Malvasia mix. The nutty, floral nose anticipates a great, savory palate. Folio Wine had the unbelievably refreshing Palacio Remondo Placet Valtomelloso 2011. This unoaked Viura wine has fruit all over the nose and an herbal touch on the palate. The Palacio Remondo La Montessa 2009 is a Garnacha/Tempranillo blend - heavy on the Garnacha - which spends 18 months in oak, yet is still light, bright and refreshing. The Artadi Vinas de Gain 2009 is a savory 100% Tempranillo wine. Frederick Wildman &Co. Splashed a nice white, the El Coto Blanco 2012 - 100% Viura aged in steel with a sweet, floral nose. Also unoaked is the El Coto Rosado 2012, all Tempranillo with lovey strawberry and herbal flavors. The fruit-forward red, El Coto de Imaz Reserva 2005, makes a great everyday wine. The Baron de Lay Gran Reserva 2004 has dusty fruit and great tannic structure. Grape Expectations Imports poured the Bodegas Lan D-12 2009, a light and delicious Tempranillo. Vinos Libres Wine Merchants splashed a taste of the Luis Alegre Koden Semi-Crianza 2010. Not an official designation, the importer calls it semi-Crianza due to its six months in oak. It is an elegant and savory Tempranillo. Waiting at Houston Bush International Airport for my return flight from Texas to Los Angeles, there was one more Texas wine for me to try. CapRock Moscato was $10 by the glass at Bubba's Bar and Grill in Terminal C.
Founded in Lubbock in 1988, CapRock Winery is in the Texas High Plains AVA. Sold earlier this year - for the second time in three years - CapRock is one of Texas' biggest wineries. Like many Central and West Texas wineries, CapRock specializes in Spanish, Italian and Rhône grape varieties. This Moscato has a yellow-green tint and an aromatic nose of flowers, pears and peaches with a slightly herbal note underneath. I was surprised by the little hint of petrol in the background, very much like a Riesling. It's on the sweet side and the fruit is the star of the palate. Sweet peach, nectarine and pineapple juice flavors reside in a nectar-like setting. It's rather viscous, and completely delicious. Tower 15 Winery was launched in 2011 by Tim Perr and Scott Knight, the guys behind the Pinot Noirs of Pali Wine Co. Having already shown what they can do with the fruit of Santa Barbara County, they let their Lompoc-based Tower 15 line explore grapes from the Westside of Paso Robles. Winemaker Aaron Walker and consulting winemaker Kenneth Juhasz do great work with the Pali Pinot, and they show their expertise with warmer-climate varieties, too. The iconic label art for the Tower 15 wines is done by by Santa Monica artist Michael Giliberti. In the same way that the name for Pali Wines is the nickname of Perr and Knight's hometown, Pacific Palisades, Tower 15's name also comes from nostalgia. Lifeguard tower 15 - along the Pali coastline - has been a family meeting point through the years, and it serves as the inspiration for the label and is a symbol of friendship and good times. The Tower 15 Sauvignon Blanc 2012 is made from 100% Paso Robles Sauvignon Blanc grapes. The wine spends three months in neutral oak barrels and was bottled in February 2013. Retail price is $18.50. This is a great summer wine, and it's not bad for spring, either. Three months in neutral oak lends a bit of weight, while the acidity is really the main attraction here. Fresh, grassy aromas join tropical pineapple, lime and banana on the nose. The palate also shows the oak's effect, with gentle spices layering the fruit in the flavor profile. The brilliant freshness remains a player into the finish. I also note a slightly frizzante quality, with bubbles clinging to the side of the glass for several minutes. A salmon-pink blend of 60% Grenache and 40% Mourvèdre from Paso Robles, Sunset rosé spends four months in neutral oak barrels. It was bottled in February 2013. The retail price is the same as its sibling, $18.50. Sunset's nose features wonderful, earthy notes alongside the smells of strawberry, cranberry and melon. As in the Sauvignon Blanc, the acidity takes center stage on the palate. It's razor sharp at room temperature and only slightly less when carrying a chill. There is also some bubbling around the rim, as in the white wine. Flavor-wise, it's a pretty meaty rosé. It displays a slightly lighter resemblance to the red grapes used to make it. There's cherry, raspberry, a hint of cranberry and just a little savory undercurrent. Pair it with a salad for sure, but make it a tri-tip salad. On my recent trip to Southeast Texas, I had the good fortune to meet winemaker Shawn Bruno at his winery and tasting room in Sour Lake, Texas - just 13 miles west of Beaumont. Bruno is a very outgoing former actor and former football star at the high school I attended a few years before him. The school is now just a memory, a victim of consolidation, but it was named after a well-known wine lover, Thomas Jefferson. When the keeper of the old school mascot passed away, Big Buzz the yellow jacket was entrusted to Bruno. Alumni will be happy to note that he had it completely restored and is ready to loan it to all class reunions. You have to pick it up and return it yourself, but that's not a problem in Texas, where everybody seems to have at least one pickup truck. If you are without one, it's your good fortune that in Texas, everybody wants to help. Bruno decided to follow his heart and continue his family tradition of making raisin wine. His great-great-great grandfather, an immigrant from Sicily, made it and Bruno's father and uncles passed the tradition to him. It was not an easy path for Bruno, though. He quickly found that it was against some Prohibition-era law to make wine from dried fruit in Texas. Not one to be defeated easily, Bruno worked for two years to have the law changed to allow raisin wine. Then-Governor George W. Bush signed the bill in 1999 and Bruno has a declaration of it hanging in his tasting room, along with a treasure trove of family memorabilia. Bruno and George Winery opened in 2000 and is distributed well in Texas. Bruno bought out his partner and the wine labels now show "Bruno Collection," although the winery's name still has George in it. The big liquor/beer/wine chain Spec's carries his product, as do other locations. The tasting room is not open all the time, but Bruno is more than happy to schedule a tasting by appointment. Call 409-287-1212 or 409-963-8235 to schedule your trip today. Don't go in thinking that the tasting will be over in a half-hour or so. That was my mistake. Our tasting was a three-hour affair. One of Bruno's favorite expressions is, "I've got a story about that, too!" I had a medium-sized group of family members in tow, and we had a great time tasting the wines - so great a time that a big lasagna dinner for the whole family had to be postponed until the following night. The text that went out to other family members on the way home read, "No lasagna tonight. Mama's drunk." It was probably not the first time that a message like that was conveyed in the great state of Texas. Cardinal Cranberry - Maine fruit makes up this great holiday wine. Big cranberry taste is just slightly tart. A sucker for mascots, Bruno named it for the mascot at the Beaumont university, Lamar. $12, a top seller. The Bruno Collection fruit wine is non vintage, as prescribed by alcoholic beverage regulations. One of the many stories Bruno told us during the tasting concerned an old vase. It seems that during the construction of the tasting room, the old, green vase - adorned with grapes - was unearthed. "They didn't hit anything else during all the digging, just that vase," says Bruno. "I like to think it was divine intervention. The way the raisin wine happened, there must have been somebody on my shoulder." The vase still has a place of honor on the tasting bar, even if it is as a dump bucket. I think his grandfather would be proud. The TSA checkpoint at Los Angeles International Airport was a breeze. Really, just a couple of minutes. The big delay was at the food court upstairs while waiting for my flight. Fortunately, I arrived at the airport about three hours early, so I had plenty of time to wait for that breakfast sandwich. I needed it. Also fortunately, there was wine. Yes, in some cultures 9:00 a.m. is a little on the early side for an alcoholic beverage. Not so at the airport. Wine. The breakfast of travelers. I filled the time with people-watching and texts to my family members in Texas about the flight number, expected time of arrival and general happiness and joy that I was finally visiting the ol' Lone Star State after a lengthy spell away. At BOA's little steakhouse express, B Grill, I ordered the breakfast sandwich and was told to sit down, it would be brought to me in the seating area. The waitress dutifully checked on me a number of times, and finally determined that I had been waiting too long for a breakfast sandwich. She repaired the broken chain of command and my egg and sausage sandwich came out quickly. The Napa Cellars Sauvignon Blanc 2011 allowed me to wait patiently. Straw-colored, with a nose of pears, tropical fruit and an herbal note that's not grassy, the wine proved very refreshing. A nice acidity opened my eyes, and the fresh-yet-savory palate was a perfect complement to the long-awaited sandwich. Winemaker Joe Shirley did an admirable job - he made a wine that's good with breakfast. The Texas wine industry got an early start. Missionaries in the 1600s planted grapes for sacramental wine. Horticulturist Thomas Munson used rootstock from wild Mustang grapes in Texas to give European grape growers a way to recover from the Phylloxera epidemic which devastated the wine industry in the 19th century. For that, the French government honored him. As is the case state by state in the US, Prohibition killed off the wine business in Texas. It didn’t begin its recovery until the 1970s. Even today, many Texas counties are still saddled with Prohibition-era laws restricting the sale of alcohol. Llano Estacado Winery is one of the first modern day Texas wineries. It’s located in the Texas High Plains AVA, one of eight American Viticultural Areas under the Lone Star. Texas has already made a few appearances in this small section of the Internet - here, and here, f'rinstance - but it's a big state and deserves another. 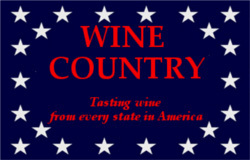 Anyway, since I made a trip to the Lone Star state recently, you'll get a eyeful of Texas wines in the coming weeks. My trip was to southeast Texas, but this wine - Viviano Superiore Rosso Texas - came to me from a clear across the state. It was kindly provided for review by the aforementioned Llano Estacado Winery in Lubbock, Texas. Llano Estacado was founded in 1976, a few years after Texas Tech University began experimenting with planting grapes under the hot, west Texas sun. They had some good luck with that grape thing. In the eighties, President Reagan served their wine at the White House. In the nineties, they shipped to Europe and Russia and were served to Queen Elizabeth when she visited Texas. In 2005, Llano Estacado was served at President Bush's Inaugural Ball. They must be doing something right. Viviano has sixteen vintages behind it, and quite a lengthy list of medals and awards earned along the way. The blend is 73% Cabernet Sauvignon from Rising Star Vineyard and 20% Sangiovese from Newsom Vineyard. Syrah, Malbec, Petit Verdot and Cabernet Franc finish off the blend. The wine retails for $35. Medium dark ruby in the glass, Viviano's nose is powerfully aromatic, largely due to the oak treatment, two and a half years in French and American oak. I would have guessed at least three years in oak, judging by the black cherry aromas that mingle with mocha, cedar, chocolate and tobacco. On the palate it's absolutely delicious, with the same sort of complexity promised by the bouquet. Blackberry and cherry lead the way in the fruit department, with anise, cola and black tea shadings getting into the action. The tannins have a bit of bite in this wine, which could easily pass for a real Tuscan blend. The tannic structure makes me expect an alcohol content higher than the 12.7% detailed in the winemaker notes. Despite the restraint of the alcohol, this wine is dry as a bone and ready for a big slab of beef, anytime. Wine lovers in Southern California - and in other wine regions in the US - get some very special treatment from Whole Foods Markets. That grocery chain has worked with a number of Central Coast vintners in recent years to produce special wines for their customers. Six wines from the cellars of notable Central Coast winemakers have recently been added to the shelves at WFM. Whole Foods Market partners with Santa Barbara County and San Diego County vintners to bring another vintage of the "One Wine" custom blends. Teaming up with vineyards including Ampelos Cellars, Fallbrook Winery, Hartley-Ostini Hitching Post Winery and Margerum Wine Company, Whole Foods Market Southern California stores are stocked with the latest from this collaborative label for a limited time. The latest edition of One Wine labels include a Pinot Gris, a white blend, and a variety of rosés and red wines. So far, Whole Foods Market's One Wine collaborations have delivered 29 handcrafted wines from Santa Barbara County, Paso Robles and Temecula wine country. Vernon Kindred, winemaker at Fallbrook Winery, sums it up best: "This entire process has been more than just creating a new wine - it's been a celebration of culture, location and the fruits of our labor." I spoke recently with Roger Fawcett, the Southern Pacific region wine buyer for Whole Foods Market. He was ebullient on the topic of the WFM One Wine program. The One Wine brand began five years ago as a line called A Collaboration, in which several winemakers combined to create a special wine to be sold at Whole Foods Market. Fawcett told me that One Wine grew from the relationships WFM already had with winemakers in California’s Central Coast. The idea of producing a wine different from the ones they already offered appealed to the winemakers and they were off and running. The process of finding the right blend for each wine is a team effort. Fawcett says WFM team members gather in a room full of beakers to blend, taste and cast votes on their favorites. The winemakers are involved, too, and he says it is sometimes the winemaker who submits the winning blend. That doesn’t seem too surprising. There are over 200 Whole Foods Markets nationwide in which beer and wine can be sold, and Fawcett says that in Southern California there are a dozen which carry spirits. He adds that SoCal shoppers now have over almost twenty Whole Foods Market stores in which wine bars are located. A few of them even offer cocktails. Pairing wine and food is a serious matter with the wine folks at WFM - take a look at the wine section of their website and you’ll find quite a few recipes there, too. Fawcett says the loca-wine movement came long before the locavore movement, but that WFM is ready to satisfy their customers’ desire for locally sourced wines. “Wine drinkers want good quality wine and in Southern California, we are lucky enough to have access to some great wine growing regions. “We really strive to satisfy our customers and concentrate on what they’re asking for. We get great feedback from the customers.” Engagement with the customer is also important - WFM sponsors real-time Twitter tastings (#WFMWine) periodically which are lively and entertaining. The Chianti tasting event, staged in April 2013 by the Consorzio Vino Chianti, was a nice event, really nice. Nice people, nice wine - really great wine, actually - and a nice, fancy Beverly Hills locale to call my home base for a couple of hours. Forty Tuscan wineries pouring their best juice in a swanky hotel is not a sucky way to spend an afternoon. It was just the good stuff. There were no squatty bottles swaddled in straw baskets, waiting to be emptied out and covered in candle wax by a sorority sister. Everything was nice. Except that I now have to write about Italian wine. It's not, unfortunately, my strong suit. I love drinking Italian wine - I even love tasting it at events where I spit out every sip I take. Understanding the intricacies of Italian wine classification, however - and boiling it down to a clearly digestible morsel - is the stuff from which migraine headaches are made. The Chianti region is a good representation of the state of Italian wine classification. I see a listing of the subregions of Chianti and it makes my head spin to read it. The thought of actually trying to disseminate that information literally chips away at my will to live, and I’d really like to make it through the night. Briefly, the eight subregions of Chianti are Colli Fiorentini, Chianti Rufina, Chianti Classico, Colli Aretini, Colline Pisane, Montespertoli, Montalbano and Colli Senesi, which is the largest of the sub-zones and includes the Brunello di Montalcino and Vino Nobile di Montepulciano areas, just to throw a little curve into the mix. By the way, there are peripheral areas not included in the subregions, and the wine made from those regions is simply called “Chianti.” This is usually about where the road starts to blur for me. Chianti has certainly been through a lot of changes. The wine of Chianti was a white wine in the 14th century. Some 400 years later the blend was dominated by a red grape called Canaiolo, with Sangiovese and Malvasia playing second and third fiddles, respectively. An 18th-century Italian statesman came up with a Sangiovese-based version of Chianti, and it was adopted by the Italian government. Now, Chianti must contain at least 80% Sangiovese and is sometimes allowed as a 100% varietal wine. Many of the small producers at this Chianti tasting event are looking for distributors. After tasting their wines, I can't hide my surprise that they aren't already represented. Importers should check the list below for undiscovered delights. The highlight of the event was the table occupied by Campo del Monde. Stefano Mantellini poured me through four wines, each better than the previous one. His Chianti 2008 and Chianti Riserva 2008 are both blends of Sangiovese and Cabernet Sauvignon. The former spent three months in oak, while the Riserva saw ten months in wood barrels. His Chianti Superiore 2007 is made up of Sangiovese, Canaiolo and Abrusco grapes which are organically farmed. The nose on this wine is very intense - almost Port-like - and has wonderful acidity and a tart finish. The Chianti Riserva "Ruschieto" 2006 is all Sangiovese and is aged in steel tanks. The savory flavor is a knockout and the acidity is made for food pairing. I thought that a Riserva Chianti had to be aged in wood, but Mantellini told me it's the Chianti Classico region which has that restriction placed upon it. Chianti does not, and he takes full advantage of that loophole with his "Ruschieto." After he poured me through his list, he waved his hand over a bottle with a wax seal on it and told me to come back later and make it my last wine. I did. It was a Vin Santo aged for seven years, a wine his family has made for decades. Mantellini carefully scraped the wax seal away from the Port-style bottle, wiped the cork, opened it and ceremoniously poured a delight. The nut-brown wine made of dried grapes smells of raisins and caramel and offers notes of coffee and toffee on the palate. Another taster beside me could only utter, "God," as he walked away. It is a heavenly sip. Another exceptional Vin Santo came from Villa Artemino. It's the color of scotch, with a nose like whiskey and a beautiful, semi-sweet taste. Certain descriptive words kept appearing in my notes - cherry and smoky came up a lot - but the one I couldn't get away from was "great acidity." Chianti is a Sangiovese-based wine, and that's a particularly good grape for acidity. It's what makes Chianti such a good wine to pair with food. Many of the producers at this event poured wines which were aged in stainless steel or cement. These wines showed a wonderful freshness and, even though some were rather young, were ready for a prime-time food pairing. Fattoria Le Sorgenti Chianti Colli Fiorentini "Respiro" 2011 prompted a "wow" moment for me. Smoke, smoke and more smoke on the nose, with a dark and smoky palate - from a wine aged in steel tanks. Marco Goracci said his lower-elevation vineyard yields the Sangiovese for this varietal wine. Fattoria Poggio Capponi poured a 2011 Chianti which is a blend of Sangiovese, Colorino and Canaiolo aged in cement. It's beautifully fresh on the palate. I would never have guessed the Fattoria Valacchi Chianti 2011 was aged in steel, not oak, with the smoky red fruit it offers. Three-to-four year-old wines were the rule, although a couple with some years on them sneaked into the room. The Azienda Agricola Casale di Giglioli Chianti Riserva 2004 was silky smooth on the palate and aromatic, too. The 2010 is still young, but is well on it's way. The Castello di Oliveto Chianti Riserva 2010 has two years in the barrel and shows an incredible savory note on the nose and palate. La Querce Chianti "Sorrettole" 2011 puts Merlot in with the Sangiovese and Colorino. It has a smoky black cherry palate in which the supporting grapes really shine. After a hard afternoon of slaving over a hot iPad at Starbucks, I called on an old reliable wine to soften the blow. At the Callender’s Grill happy hour, the Celtics and Knicks were going at it on the TV while shop talk and vacation plans were discussed around me. I had my own vacation plans to think of - a trip to Texas to visit my family and the promise of some Texas wine and food with loved ones I had not seen in far too long. I'll let you know about that Texas wine in this space soon. The Ravenswood Napa Valley Old Vine Zinfandel 2009 seems to be a blend of Zinfandel, Petite Sirah and Carignane sourced from various vineyards in the Napa Valley, with a nice happy hour price of $6.75 by the glass. It’s very dark in the glass and makes its presence known right away. The nose is big and juicy, with blackberry, black cherry, cedar and spice exploding from the glass. I think of the Ravenswood tag line, “No wimpy wines,” and figure this must be what they mean. The palate is lush with dark fruit, and loaded with spicy cinnamon, vanilla and white pepper. It’s very smooth in the mouth, with firm tannins surfacing on the finish. It certainly washed the happy hour sliders down properly. While waiting for my wine, I noticed a tap at the bar for Bass Stout. When did Bass get tired of being the lighter side of a Black and Tan? Fairly recently, apparently. The bartender said it’s a brand new entry in the beer field. It's not quite as thick and full as Guinness and lacks the creaminess of the venerable Irish stout, but it hits pretty darn close. Barkeep told me this Callender's (Wilshire, Miracle Mile, Los Angeles) is one of the first places to carry it.